Shortly after the adoption of the county flag, which features the famed pectoral cross of Saint Cuthbert, a vote was held to select a date for celebration as County Durham Day. The winning date was the saint’s birthday, March 20th. Of supposed noble origins, as a boy he learnt the arts of war and it is believed that as teenager fought in at least one battle. The course of his life is believed to have changed, when, aged seventeen, he said to have spied a light drop to Earth and then return to the sky. This was the night that the Irish missionary Aidan, who had established Lindisfarne, died and believing that the light was the passage of a human soul, Cuthbert resolved to join the monastery at Melrose, which Aidan also founded and asked to be admitted as a Novice. He was appointed guest-master at the new monastery at Ripon, then in about 662 prior at Melrose. In 664 the Synod of Whitby decreed that that Northumbria should look to Rome for spiritual guidance, rather than Ireland; the Irish monks returned to Iona and the abbot of Melrose subsequently became also abbot of Lindisfarne and Cuthbert its prior. He is thought to have lived there for the next ten years. He ran the monastery and was an active missionary, much in demand as a spiritual guide. He is also said to have developed the gift of spiritual healing. Reputedly outgoing, cheerful and compassionate, he was likely very popular but at about the age of forty, he felt a calling to be a hermit, to fight the spiritual forces of evil in a life of solitude. In time he moved to the island known as ‘Inner Farne’ and built a hermitage where he lived for a further ten years, although it seems people frequently visited in their little boats to consult him or ask for healing! had been slain by the Picts doing battle in Scotland. Owing to ill health he resigned his position in 686 and retired back to his “Inner Farne” hermitage where he died on March 20th 687.
and studded with garnets, was discovered, buried amongst the robes on the body. 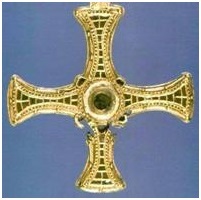 Cuthbert’s Cross features on both the flag of County Durham and that of the Scottish county of Kirkcudbrightshire, named for the saint. St Cuthbert’s Society, a college of Durham University established in 1888, is named after him and is located only a short walk from the coffin of the saint at Durham Cathedral. The Society celebrates St Cuthbert’s Day on or around each 20 March with a magnificent feast. “Cuth’s Day”, the annual college day, is celebrated in the Easter term with music, entertainment, festivities and drinking. Cuddy’s Corse is a waymarked walking route between Chester-Le-Street and Durham Cathedral; it marks the journey between two of the last resting places of the coffin.